. 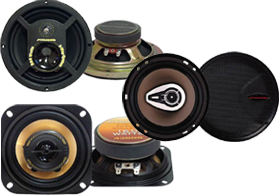 Pyramid Car Audio offers a wide variety of size design and output strengths that can withstand power at its peak without damaging itself. Pyramid Car Speakers are made from top-quality materials that improve the efficiency and potential of the speaker. Moreover, you can take full advantage of your favorite hits without any kind of interruption and distortion thanks to its improved impedance capability. HalfPriceCarAudio.com carries the best and nothing less than the best!